All Palestinian prisoners jailed by Israel are political prisoners, jailed for being Palestinian – existing and resisting against Israel’s ethnic cleansing and military occupation of Palestine. We will stand in support of the nearly 6000 Palestinians security detainees and prisoners being held in Israel Prison Service (IPS) facilities, including 310 from the Gaza Strip. Over 200 are Palestinian children. 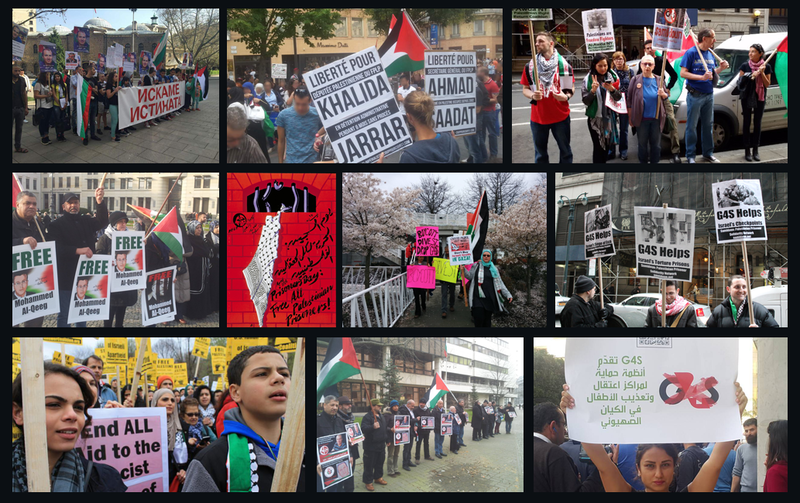 This is also in response to a call from Samidoun for a week of international demonstrations on the 10th anniversary of the Israeli sentencing of Ahmad Sa’adat, the General Secretary of the Popular Front for the Liberation of Palestine. Sa’adat was sentenced to 30 years in prison, convicted in an Israeli military court of leading a prohibited organization and “incitement.” He has stood strong as a major Palestinian liberation leader from Israeli jails, as have many others before him. He stands alongside nearly 6,000 fellow Palestinian political prisoners in Israeli jails on the front lines of the liberation struggle. As such, he is a symbol of Palestinian, Arab and internationalist resistance to capitalism, racism, apartheid and colonization.